Earlier this year Mike Shepherd, chair of Windmill Hill Big Local, was one of a select few to be invited to attend an event with HRH Prince of Wales to celebrate his 30th anniversary as President of Business in the Community. The event was attended by those involved with the Business Connectors scheme. Business Connectors are people seconded (temporarily transferred to other employment) from businesses and placed in communities to build partnerships that tackle local issues. The scheme was set up to transform the way businesses and communities interact and encourage stronger partnerships in local areas. 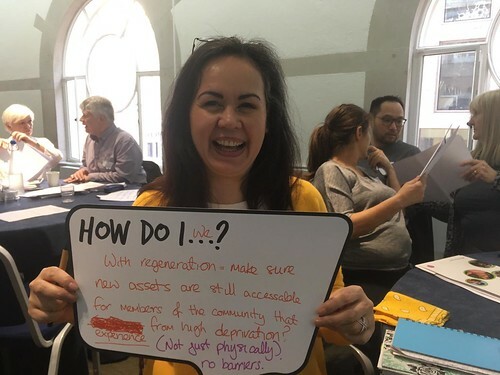 Windmill Hill Big Local has been working with Zoe Gill, the business connector for Halton, who was seconded from Fujitsu and lives in the local area. Together they have formed some valuable relationships with local businesses. A particularly successful partnership has been the one formed with O2, who have a call centre near Windmill Hill. O2 has partnered with Windmill Hill Big Local on a successful digital inclusion project; they have also provided meeting spaces, free printing and have loaned iPads for use at events. I caught up with Mike at our recent spring event in Manchester. Mike described the synergy between Big Local and the Business Connectors scheme. Mike had a great time at the event and, although he was too modest to say, I have it on good authority that HRH spent far longer talking to Mike than he did anyone else! If your Big Local area is involved with the Business Connectors scheme, get in touch and let us know. We are happy to share your experience on our website. You can find out more about Windmill Hill Big Local on their social media links below.